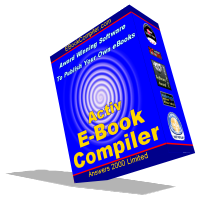 One of the best features of Activ E-Book Compiler is to create eBooks with all the menus, dialogs, etc., translated into a language of your choice. While you can do these translations yourself, several of our users have created translations and been kind enough to share them with other users. These include translations into Danish, French, German, Hungarian, Italian, Polish and Spanish Castellano. Gábor Kisfaludi who created a Hungarian translated, has just updated it with an improved version, and this is now available for download. July 2nd 2007 - Gábor Kisfaludi has been a busy bee - and provided a further update to the Hungarian translation. It’s now available at the usual place. It’s an ICANN rule that domain registrants have current correct contact information, but what happens if there is a mistake in your contact info? Say, for example, you changed email address but forgot to update the email address in your domain registration record? Well if you registered with GoDaddy, it seems that they might just take your domain away, even though it’s bought and paid for, and is yet to expire. That’s what happened to the owner of FamilyAlbum.com, after he failed to respond to an email requesting that he check/update his contact information. GoDaddy’s response is here. To add insult to injury, the information available suggests that GoDaddy made some money reselling the domain in question via a back-order (this is where a person can order an already registered domain with the hope that the current owner will abandon it or let it expire), and if you visit FamilyAlbum.com now, you’ll see a GoDaddy parking page (which I’d imagine GoDaddy makes money from too). My own question about GoDaddy’s response is this: They apparently feel that if you don’t respond to email for some period (the exact period isn’t clear from the news story, but it appears to be 8 weeks or perhaps less), that they are entitled to take the domain back - but what if the domain owner is sick? Or vacationing? Or climbing mountains in Antarctica? Because, remember not every domain owner is using their domain to run a business. ICANN requires valid contact information, but, as far as I know, doesn’t specify a time limit for how quickly domain owners must respond if contacted. And of course the obvious one: What if the registrar’s email(s) requesting that it be checked/updated accidentally landed in the domain owner’s spam folder, unnoticed? What if the contact info, including address, phone number and email address, are all valid and current? Could you lose your domain for failing to update that which is already fully up to date? Or an even more scary scenario: What if the malicious person who wanted a particular domain, simply mail bombed the domain owner (sending so much email continuous to flood his inbox and guaranteeing that he can’t respond to email). The malicious person would have to keep this up for a while…. but, if he did…. could he acquire a domain name by guaranteeing the owner won’t be able to receive/respond to GoDaddy emails? 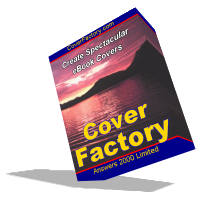 As you probably know, CoverFactory is our program for creating 3D-style eBook cover images (and images of software boxes, membership cards, CD-ROMs, floppy disks, zip disks, etc….). I’ve already written recently about some improvements that we’ve made to the CoverFactory.com web site so that site better reflects what the software can do. I have some additional news: today, we have released a new version, version 2.50 of CoverFactory. If you’re an existing customer, you can upgrade to the new version free of charge: instructions are on the download page. And, if you’ve not purchased CoverFactory, why not download the free trial version and try the program out for yourself. The most important changes in the new version are enhancements to usability. These changes are intended to make it easier for a novice user to produce a high quality cover image. The changes include enabling the Enhanced detail and Soften Edges functions by default (which both can help to produce a better final image). We’ve also made the default cover size larger, and we’ve started off the Background, Render and Layout tabs at 100% zoom. Additionally, there are also improvements in the quality of the rendered images, the Help instructions, and in the user interface of the program. The user interface improvements include making the font preview larger and much easier to see. Anyway, why not download it and you can see yourself. I think you’ll like the new version. CoverFactory is our company’s software for making 3D images of eBook Covers, Software Boxes, Membership cards, etc. It’s evolved into very powerful software, and it’s way cheaper than the competition, but I recently realized that we were underselling it. And by "underselling it, I don’t mean that we want to raise the price! The problem was that CoverFactory has improved with time, and got substantially better. However, despite several releases of the program, the example images on the web site, hadn’t been updated. As a result, the examples didn’t fairly reflect the capabilities of the program. The CoverFactory home page and the gallery of sample eBook Covers on the site have now both been updated. I think that they now give a fairer reflection of what the program is capable of, even in an ordinary mortal’s hands (Sunil: all the images were created by me - and I am absolutely not a computer artist). I had saved all the old cover projects made with a much earlier version of the program, so I could of course simply load them in using Open… on the File menu. Some of my projects were in fact so old (made using 2.00) that recreating the background (see this tip) helped. In my case, I couldn’t quite remember which projects these were, so I simply recreated the background on all my projects. The default size that CoverFactory renders covers at, is 200X200 pixels. That is actually pretty small on modern screens (we may increase the default in a future version), and if you really want to see the detail of the final image, you’ll probably want to render the cover bigger than that. You can do this by going to the Background tab, double clicking where it says Image, and then changing the size on the second page of the wizard that is displayed. The examples at the top of the CoverFactory.com home page are 200X200 and 300X300 pixels. The bigger examples (halfway down and at the bottom of the home page) are 615X615 pixels. This next point does not actually affect the quality of your final cover, but it is nevertheless important. The Render tab in CoverFactory, by default, displays the final cover zoomed in to fit the available screen area. As on most computers, the screen area is larger than the cover image that is being rendered, the image is zoomed in (enlarged), which can be deceptive - it can make it appear as if your final cover is going to be chunky and pixelated. On the Render tab click the 100% toolbar button (or View menu, then Zoom sub option, and finally 100%) to see your cover as it really is. On the Render tab under Rendering Options, double click on Detail and set it to Enhanced. Also on the Render tab under Rendering Options, double click on Soften Edges and set it to Yes. If you’ve read the tips on the CoverFactory web site, you’ll already know from this tip that enabling Folds Shown (under Object Properties in the Render tab) works best if Soften Edges is also enabled. In our sample images, we did indeed use this combination on some images - we found they they worked best for us when we choose a Folds Color that was subtlely different from the other colors around it in the cover, rather than something that stuck out like a sore thumb. That’s it for now - do check out the new CoverFactory.com, and if you haven’t already purchased it, why not download the free trial version of CoverFactory.